Seeking healing from her thwarted romance and for her patchy balding skull (due to a vengeful hairdresser), Agatha is on vacation yet again. Selecting a lonesome beach retreat by closing her eyes and pointing at a map, Agatha is disappointed by the dismal Wyckhadden where the weather is wicked and all the denizens elderly. Making depressing friends at the hotel, Agatha is an honorary member of the venerable grey-hairs club, playing Scrabble every night and wailing over her lost youth and her constant obsession, James Lacey. Ever hopeful, Agatha consults the local witch for a hair tonic and (even better!) a love potion which she tries out on a dashing copper. When the local witch winds up dead, however, and Agatha discovers her corpse in the middle of the night, the nightmare truly begins. Wanting nothing more than her cozy cottage and cats, Agatha seeks to find the murderer so that she can go home. In the meantime, she’ll keep playing with that love potion, setting aside just enough to give to the indomitable Lacey when she returns with her full head of hair again. 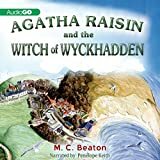 Ninth in the endearing cozy mystery series, Agatha Raisin and the Witch of Wyckhadden continues the journey of our tough yet vulnerable sleuth. Worldly wise yet teenage in her affections for newfound friends and lovers, Agatha oscillates between strength and weakness. She’s softened since the early days, and despite her discomfort with all the old things in the hotel (reminding her that she’s not that much younger, really), Agatha becomes involved in their friendships and romances. Trying to fit in yet not comfortable with her crowd, Agatha makes the best of a bad situation, and finds herself nearly accused of murder. The atmosphere of crashing waves, cold boardwalks, and wicked witches gives the tale a spooky resilience that captivates. Agatha’s adventures (or misadventures as may be) are heartwarming and oddly painful, intermixing happiness and sadness in the reader. We love Agatha, even though she hurts herself and, sometimes, those around her. We grieve for her, yet admire the simplicity of her Cotswold life. Agatha remains her vibrant, yet depressed self throughout, and when the bodies start piling up, readers settle in for stormy seas and sleuthing. Rich in backdrop, characterization, and tension, The Witch of Wyckhadden started as one of my favorite Agatha adventures. The stories where she goes abroad for holiday seem to be some of the best; the scenery is richer, the concentration on Agatha herself more full, and often the mystery more unexpected or bizarre. 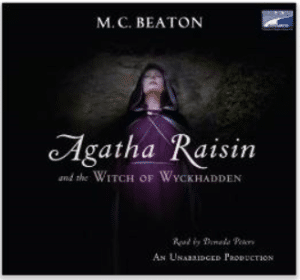 Sadly, for a novel that started so strong, The Witch of Wyckhadden is one of Agatha’s most disappointing detecting moments, since the murderer inexplicably comes to her to confess. Agatha isn’t in danger, and the ominous nature of the mystery is played off on an unhinged killer with no true motive. Regardless, the cozy is still very much alive; Agatha’s love life (both a bane and a boon to the series, depending on the story) gets even more complicated, and more of her character (and character flaws) are revealed. Readers maintain their closeness with Agatha despite the letdown of the conclusion. The writing paints a portrait of Agatha’s emotions and the Spartan atmosphere that surrounds her. Recommended! *A Note on Edition: I listened to the audio book edition of this novel, as read by Donada Peters, the original narrator of the Agatha series; audiobooks read by Peters are only available in older editions via the library. The newer editions, read by actress Penelope Keith, are also superb however. Both readers create the character of Agatha and bring the cozy alive. Don’t miss the audio edition of this mystery.